Urine that is optimally diluted is usually a pale shade of yellow, sometimes even close to clear. However, it's possible for urine to turn several different colors, including orange. Orange urine should make you take pause. Though it may (and usually does) simply mean you need to drink more water or that a medication you're taking is to blame, the color could point to a serious health concern. It's always worth a backward glance before you flush to see what clues about your health may be waiting and to mention anything out of the ordinary that you see to your doctor. 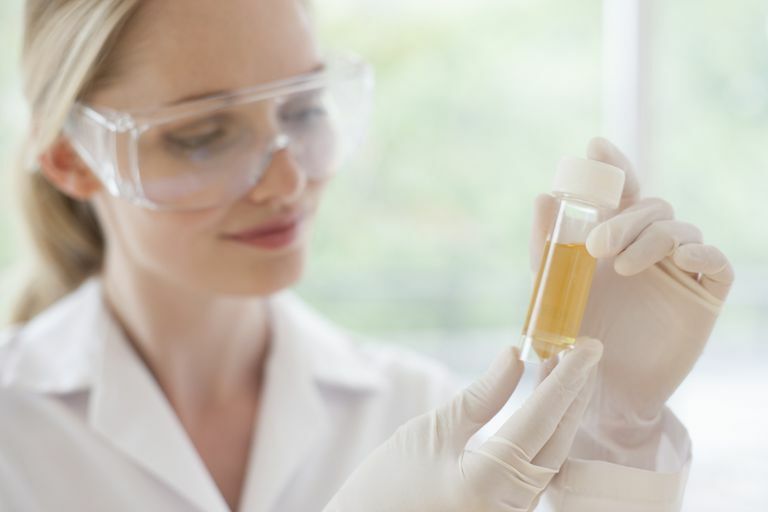 The recipe for urine isn't complicated: It's simply the byproduct of blood that's been filtered by the kidneys, which process between 120 and 150 quarts of blood each day, according to the National Institute of Diabetes and Digestive and Kidney Diseases (NIDDKD). The result: One to two quarts of urine made up primarily of extra fluid and waste products the body can't use and, therefore, is stored in the bladder until it needs to be emptied. Urine gets its signature hue from a pigment called urochrome, which is created as a result of the breakdown of dead blood cells. Urine is a yellow that varies from pale to straw-colored under normal and healthy circumstances. Water from beverages you drink and even the foods you eat (juicy fruits and vegetables, for example), dilutes urine. If your pee is orange (or dark yellow), it probably means you aren't drinking enough water or getting fluids from other healthy sources. Since it's likely you don't drink throughout the night, you may notice that your urine is darker in the morning. You might also find that your urine is darker after a sweaty workout due to fluid lost through perspiration. Research shows that the color of your urine is a good indication of whether you're getting enough fluids to meet your body's requirements. If yours is dark yellow or veering into shades of orange, that's a sign to up your fluid intake. Plain old H2O is the most efficient way to do this. Foods and beverages that are red, orange, or very dark yellow can darken urine largely due to the beta-carotene they contain. These include carrots, carrot juice, and, for a very small proportion of the population, beets (although beet-tinted urine may look more red than orange). You also might notice your urine tends toward orange if you take high doses of vitamin C, beta-carotene, or vitamin B-12. Laxatives: Certain ones that contain senna, an herb used to relieve constipation, often cause pee to turn a reddish-orange color. One example is Senokot. Pyridium, Uristat, and other drugs containing the active ingredient phenazopyridine: These medications are prescribed to relieve pain caused by urinary tract infections (UTIs). Besides urine, phenazopyridine can discolor things it touches—even contact lenses. Rifadin and Rimactane (rifampin): Combinations of drugs containing this antibiotic and isoniazid, such as IsonaRif and Rifamate, may have the same effect. Azulfidine (sulfasalazine): This is an anti-inflammatory medication that's used to treat bowel inflammation, diarrhea, rectal bleeding, and abdominal pain caused by ulcerative colitis. A delayed-release version sometimes is prescribed for people with rheumatoid arthritis who aren't getting relief from other medications. Besides turning urine orange, Azulfidine can cause the skin to take on a yellow tinge. Neither of these side effects is harmful. Doxorubicin: This is a powerful chemotherapy medication that's given intravenously (through a needle into a vein). Doxorubicin can cause a person's urine to be orange or even reddish for a day or two after treatment. One condition that's especially associated with orange-ish or dark-colored urine is cholestasis, in which the flow of bile (the digestive fluid that's produced in the liver) stops at some point between the liver cells that produce it and the duodenum, the first segment of the small intestine. This allows the escape of bilirubin into the bloodstream, where it can build up and eventually tint the urine. If you experience any of these, see a doctor, who can perform blood tests and, if necessary, an ultrasound or biopsy of your liver. Detecting and treating cholestasis promptly is key to preventing further damage to your liver or bile ducts—and to allow your urine to return to a healthy hue.